"Walk the streets of Korea, and you’ll see that it’s all about flawless, glowing skin. And while impeccable Korean skin has been receiving lots of attention world-wide, it’s the notion that multi-step cleansing, toning, and prepping the skin prior to makeup application to achieve flawless skin that captured the hearts of many beauty junkies. With this box, you’ll see that the mythical Korean cleansing routine is not actually a fable, and that the mysterious application techniques aren’t so mysterious after all. All products are gentle to use, even for the most sensitive skin types, to dissolve away even the most stubborn makeup, and extract all despicable pore-cloggers! The results? You'll have sparkly, gorgeous skin that glows from within!" Memebox Product Description: "This makeup remover goes on as a sherbet-like balm and transforms into a silky oil that effortlessly dissolves makeup and sunscreen. Its non-greasy, gentle formula made from papaya, acerola, and herbal extracts cleanse thoroughly without dehydrating the skin." How to Use: "Take out the formula and gently massage into skin. Rinse off with water or wipe away with a tissue." I received a deluxe sample of the original Clean It Zero in a previous box and really liked it..used it up as a matter of fact. Happy to get this set, with a green version to try. Only wished that we got a full-size. Memebox Product Description: "A foam cleanser made from mineral-rich hot spring water and packed with citron extracts and citron seed oil, this product thoroughly cleanses deep into your pores yet delivers rich moisture, leaving skin glowing with a natural translucence." How to Use: "Use a cleansing oil to remove makeup first. Then, lather the foaming cleanser to create enough foam and gently massage it over your face"
Not too exciting. Too many of these foam cleansers already. It will probably end up as a shower body cleanser, though I'm interested in the citrus fragrance. Memebox Product Description: "A tea bag for your cleansing routine! When the tablet melts in warm water, the pH level becomes 4.9, the optimal level for the skin, to give you the gentlest deep-down cleansing experience. The green tea infused tablet will detox and deep clean the skin while also soothing irritated skin." How to Use: "Remove makeup and impurities first. Drop the table into a bowl of water and wait until fully dissolved. Gently pat your skin with the water. Do not rise afterwards." Nice packaging, and a new type of product I've never tried. A couple more of these in this box wouldn't have hurt. 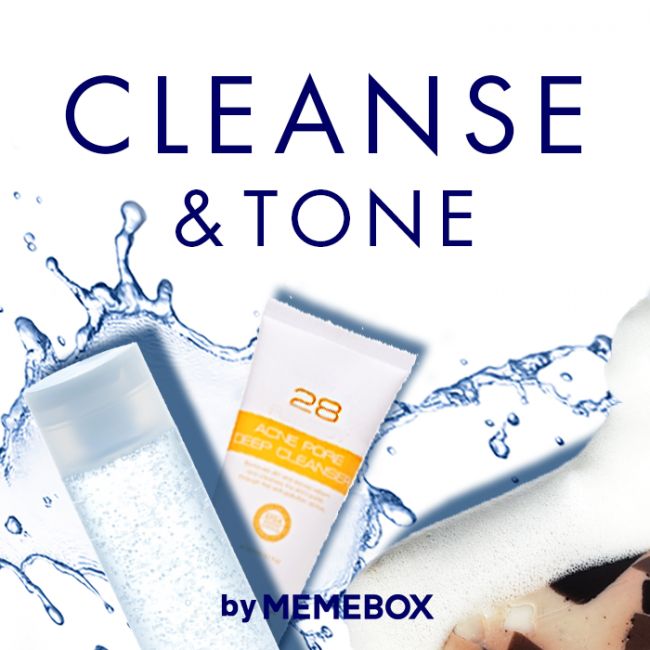 Memebox Product Description: "A lightweight toner for instantly hydrating and rejuvenating the skin in the very first step of skin care. Naturally fermented glucose complex deeply soothes, replenishes, and firms up dry, aging skin for a more youthful complexion." How to Use: "Wet a cotton pad with the toner and gently pat it all over clean face and neck." I started using this a week ago. The toner comes out in a fine mist spray and I haven't bothered using a cotton pad. It definitely is lightweight and gentle. Liking it so far. Memebox Product Description: "Cotton Shower Sheet Essence is a small pack-like sheet soaked in rich nutrients - spa water, shea butter, and witch hazel - and it can be used as a first step toning sheet or placed over dry patches as a smaller version of moisturizing sheet masks. The one for dry skin types contains soothing, moisturizing, and nourishing agents while the one for oily skin type offers sebum control and anti-wrinkle effects as well." How to Use: "Wipe over cleansed face as a toning sheet or place it over dry, sensitive areas of your face until the essence is well absorbed." I opened this the other day, thinking that it can help the dry skin on the back of my hand. Maybe my skin was too dry and irritated, or the ingredients was not right for me, my hand felt quite irritated and I had to remove it after a minute. Nothing soothing about those sheets. Don't know if I'm going to try this on my face. Memebox Product Description: "Easy to carry around, disposable cleansing tissues enriched with nutrients from one of nature's oldest plant - ginkgo tree. Its nature-friendly formula is gentle to all skin types and it effectively wipes away all traces of makeup residues and skin impurities. How to Use: "Take 1 sheet and remove lip & eye makeup first. Then gently wipe it all over the face." Not a big fan of makeup wipes..I just feel like I still have to wash my face with a cleanser and water to really get rid of makeup. I guess the test to do is to wipe with a cotton pad and toner after using one of these sheets to see how well it actually cleanses. Quite a disappointing box to me. Was really hoping for some cleansing oil. The Banila Co. product was as close as we got to an oil cleanser here. I would not have purchased this box if I'd known what the contents were. Not recommended. For a list of Memeboxes sold to date, as well as my blog links go to my Memebox Page. If you're looking to make a purchase, be sure to check my Current Memebox Promotions blog for coupon codes and current sales. Ipsy Glam Bag June 2014 "Pretty in Paradise"